Happiness is a hot pierogi: Play Ball! There are few things greater than a sunny day and baseball. 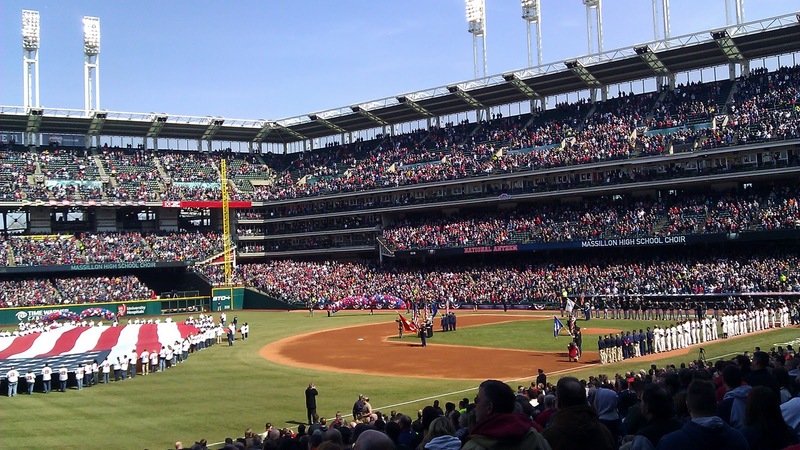 Cleveland Indians games are the start of Spring and better things to come. The long winter has been banished and everything starts over. I look at it as a re-do for the year. Having recently returned from Indians Spring Training, I was, to put it simply, super excited for Opening Day. I have not been to an Opening Day in years. Fortunately for me, I have a very understanding boss and I was able to take half the day off to get to the game. One of the many things that I love about Cleveland is the excitement for a new season. We are so used to “waiting for next year” that when it finally arrives it is like the Easter Bunny and Santa Claus hopping down the street. 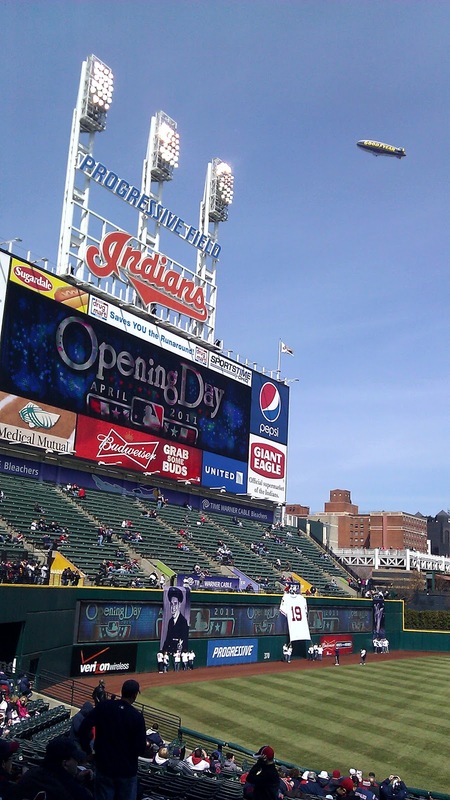 The city of Cleveland was buzzing about the start of the Tribe’s season. So many people were pumped up for the game that getting to work was a breeze since so many people played hooky. The sun was shining. It had the makings of an awesome day. It is important to note that I normally have an “I don’t pay for parking” philosophy. In Indianapolis, I know of every secret parking spot or if I have to pay *shudders*, I know of the $3 lots, even on event days. Cleveland? Not so much. After circling round and round and a flurry of words inappropriate for anyone reading my blog at work, I finally found a $10 lot. I love Cleveland, but parking in Cleveland is on my list of things I hate. Although, I could have been trying to park in Chicago, which is hideous, so I decided to be grateful and paid my 10 bucks to hoof it to the ballpark. I made my way towards the park and with a bit of sadness, watched groups of people taking pictures with the Bob Feller statue. The police officer even got into the spirit and played photographer for the day. It was nice to see how important Bob Feller is to the fans. After a trip to the Tribe Wheel of Fun (that is what I call it), and my first hot dog of the season, I made my way to my seats. The seats were great. An amazing view of the park and field. And in the shade. I made a mental note that these would be perfect seats for a sweltering day, all in an attempt to stay positively warm. 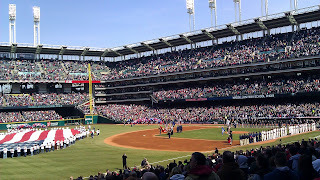 The Indians had a video reel of Bob Feller and his wife was later escorted onto the field to place a ball on the pitcher’s mound in honor of her late husband. *sniffles* Major League Baseball was a bit grinchy and would not allow the Indians to wear Feller’s number during the game, so all the players wore #19 during the tribute and then later changed. This was the point that I decided I am going to buy a Tribe jersey with Feller’s number on it. No way to go wrong with that one. During the game, the Indians were not on top of their game and the crowd started to drink a little more and become a bit more entertaining. I had the interesting pleasure of sitting behind a couple that instantly reminded me of the episode of Rosanne in which Sharon Stone was living in the trailer park with Mark and Becky. I have never in my life seen two people drink more beer. Both of them had a beer for each hand and they were tossing them back like Kool-Aid. I think their goal was to get slizzerd. This went on for a few more minutes, her barking about wieners and her hatred of wieners, until she grabbed his wallet, took all his money and said she was off to get some real food. Not no damn wieners. 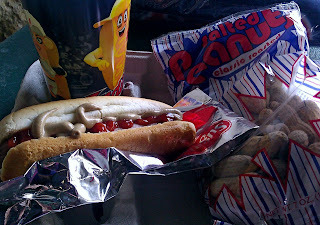 I was just glad I had already eaten my damn wiener and had moved on to my damn peanuts. The Tribe lost the game, even after a surge toward a comeback. But I was still happy to be at the game. I’m just happy to be back in Cleveland. My damn wiener. 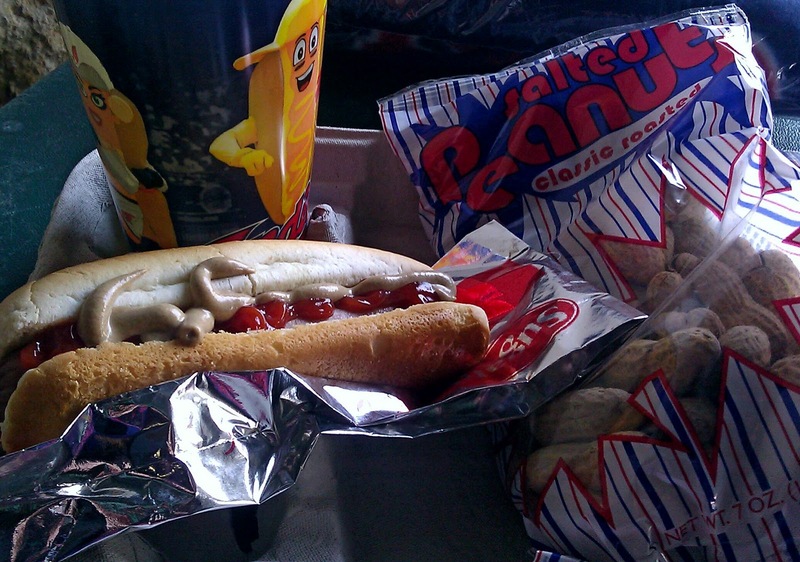 Sadly, the Tribe took away the relish.